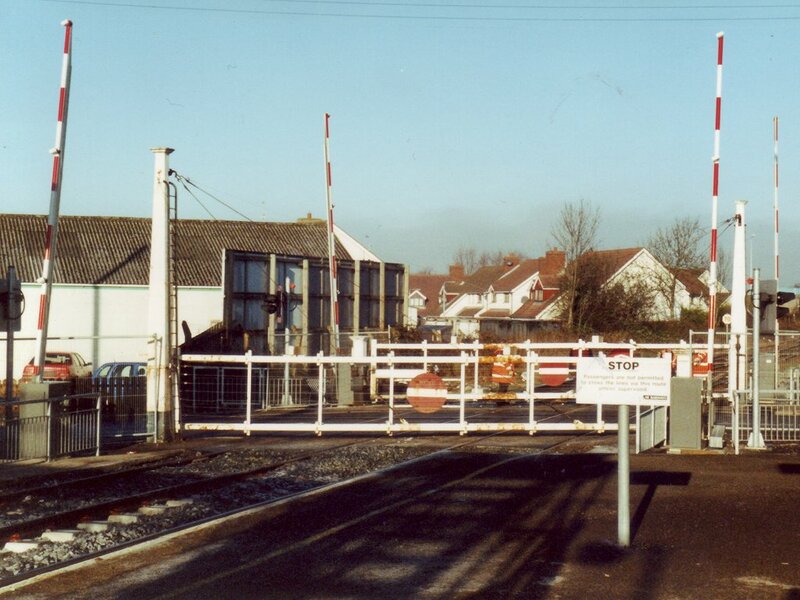 Why Antrim's level crossing has barriers for both road and rail escapes me - but it seemed worth a phot at the time. After my strictures at railway society AGMs about Ulster not being ‘Overseas’ if the Isle of Wight wasn’t, I probably shouldn’t be making notes today… Nevertheless, punctual taxi at 0550 (their suggestion not mine) got us to Telford Central in good time for the 0617, driven by the King of the Early Brakers. He just managed to get to Wolves in time to delay the 0649 Euston and 0652 Coventry by leaving at 0649 himself. We picked up the Euston at New Street, arriving at BHX at 0735 after a fortunate bus connection. Just as well, as we had no tickets due to either failure of BA to despatch, or failure of Royal Mail to deliver. H queued at the checkin while I collected tickets from BA - ‘I’ve done dozens of these this week’ pretty much told its own story and seemed to exonerate Royal Mail. The whole process took 20 minutes, then another 20 to queue for a revolting cup of tea. Excellent flight to Belfast Aldergrove with (by airline standards) first rate hot breakfast from Maersk Air. The Antrim Airlink bus took us (and nobody else) to Antrim for a princely £1.25 each. At Antrim you get your all day bus and train pass from the bus office. Well, obviously. After freezing for half an hour we had the pleasure of an hour’s trip (due to 10 minutes wait for a southbound service at Ballymena) in an unheated MkIIa with centre doors. Bustitution was in action to Portrush but local enquiries suggest it might be OK later/tomorrow. 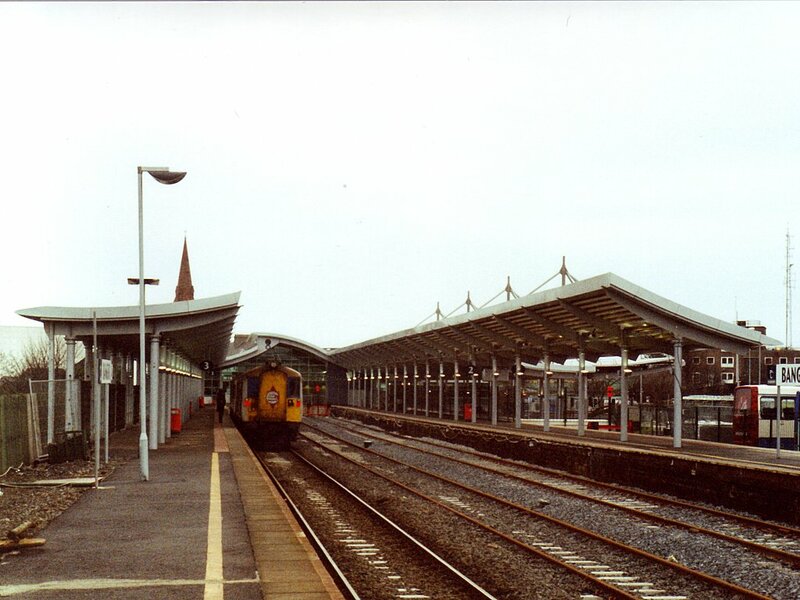 This photo of 'our' DMU 8787 at Londonderry on 9.2.01 took just long enough for us to miss the shuttle bus. I should have done my homework properly. The 1221 to Londonderry was warm, thank goodness. The fog had cleared and we enjoyed a very pleasant ride along the coast and then the Foyle estuary. The station is on the opposite side of the river from the city centre, via a double deck bridge. Having missed the shuttle bus we waited for a while at the nearest main road stop. When a bus with a ‘Private’ blind stopped we made enquiries - a kindly driver informed us that the stop had no service but offered to take us into town. A very pleasant extended lunch was taken by the fire in ‘Badger’s’ which despite some Hall & Woodhouse beermats on the wall, had only Smithwick’s to offer. It wasn’t bad, though. A wander round ‘Derry for the afternoon proved quite rewarding, if very cold. It included a visit to the cathedral (garrulous verger), the ‘Bloody Sunday’ exhibition at the Orchard Gallery (overfunded, undertalented), the Guildhall where the Bloody Sunday Inquiry is in progress (impressive) and a café providing the largest piece of chocolate cake I’ve ever been expected to eat half of (spectacular). A walk round part of the city wall was also enjoyable, if dangerously icy. The rail link bus this time provided transport back to the station where a 2+3 car DMU was waiting. This left on time and with the light fading (1735 departure) the run alongside the Foyle was different, and arguably better! At Coleraine things started to go pear shaped. 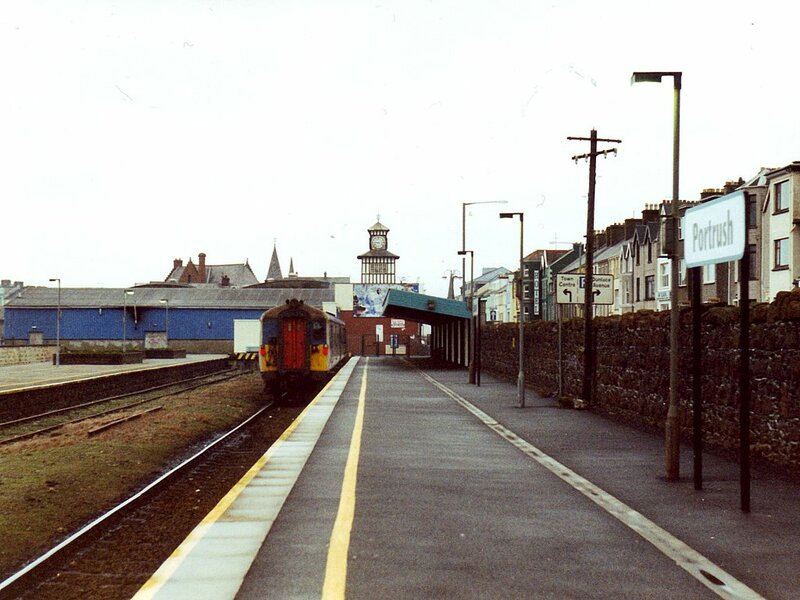 The 2 car was detached from the rear and Man A said he thought it was probably going to Derry (there was no sign of the Portrush branch train). Man B didn’t know what was happening and (along with several other bemused travellers) we eventually found Man C, the inspector, who was still connected to reality. He explained that the incoming Belfast - Derry train was a near failure beyond Ballymoney and the Portrush kart had been sent to Ballymoney to drag it in. 1900 was a reasonable bet, he thought (scheduled 1823). We retired to the Railway Inn across the road for keg Bass, and phoned our landlady-to-be to advise late arrival. Returning at 1855 there was no sign of a train, but announcements kept us fairly well informed. The Portrush kart, with ailing Derry in tow, eventually turned up jast after 1920. Units were split, passengers transferred to ‘The Boys’ Brigade’ which as prophesied went back to Derry and we finally went at about 1935, just over an hour late. 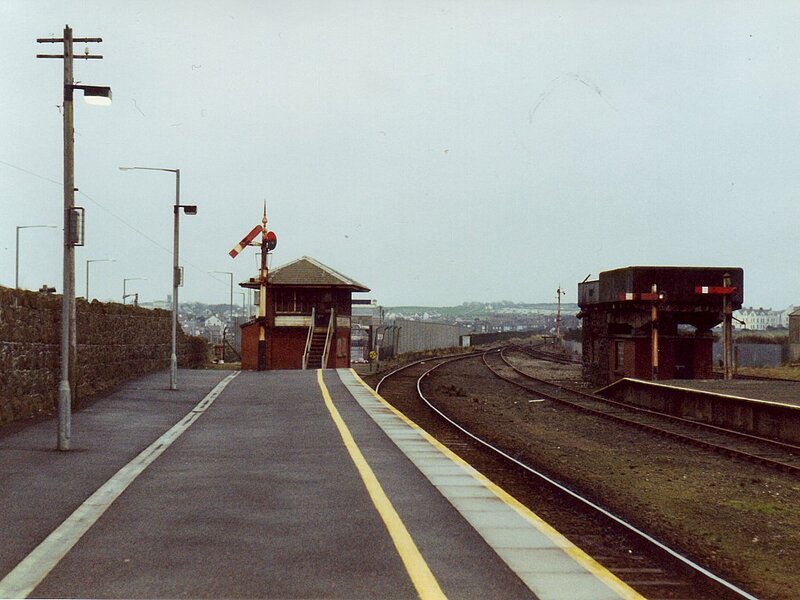 It's hard to criticise a railway which has to run its trains around with 'Save our railways' on the ends, so I'll just say that Portrush is typical of NIR's fairly minimalist rebuilds! On arrival at Portrush I failed to read the directions properly, causing us an extra walk in a wind so cold it actually hurt, but we still reached Beulah House within 10 minutes. Our landlady advised on eating options and we trundled off to the entirely admirable (except for keg Bass again) Harbour Inn for roast chicken and kebabs. Uneventful trundle down to Great Victoria St via the soon to be closed Antrim - Lisburn stretch which was the main point of the trip. It seemed to be generating some custom at the intermediate stations; will Prescott let them close it? [The passenger service was withdrawn in 2003, but it lingers on in use for diversions and driver training - and Translink now has reopening plans]. 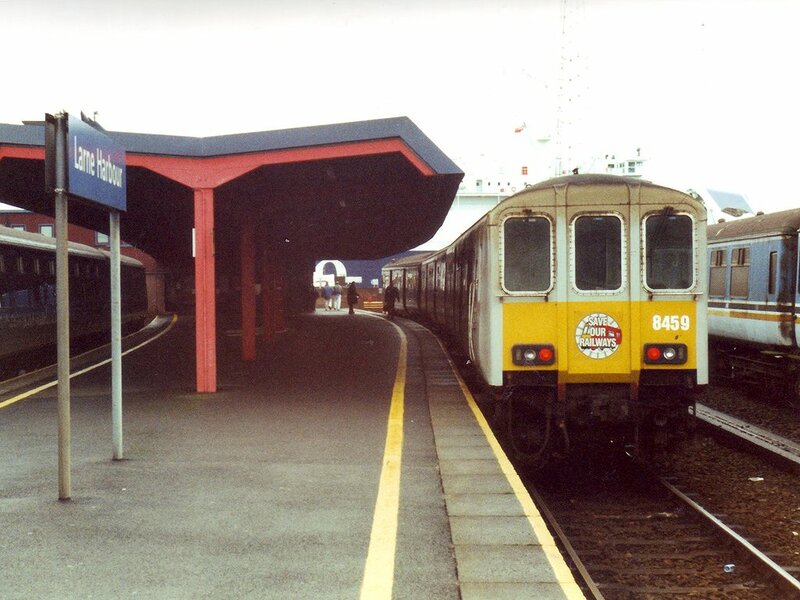 8459 stands at Larne Harbour, overshadowed by the Cairnryan ferry. At GV St. we clocked the Crown opposite but decided to go into the city centre for a look. We did, and found a thriving provincial city. [In contrast to a lot of what had been seen on UK television ever since the 1960s - but in fairness I did see other aspects in a later visit]. Pausing for advice at the Tourist Information Centre we learned that the Crown is indeed a National Trust pub so we hot footed it back for Caffreys and Guinness (much preferred the Caffreys) and Irish stew which was better than either for a mere £3.25 each. This having delayed us until 1345 we caught 1351 to Belfast Central which was late, causing major concern about the 2 minute (booked) connection on to the last daylight train to Larne Harbour. [Most trains only going to Larne Town]. The connection was held as promised and the run out to Larne was an interesting one, being alongside the water for a lot of the way. A very quick turnround at Larne Harbour just allowed two photographs, then it was back to Belfast Central for a grotty cup of tea in the exceptionally depressing buffet (in fact an exceptionally depressing station altogether). 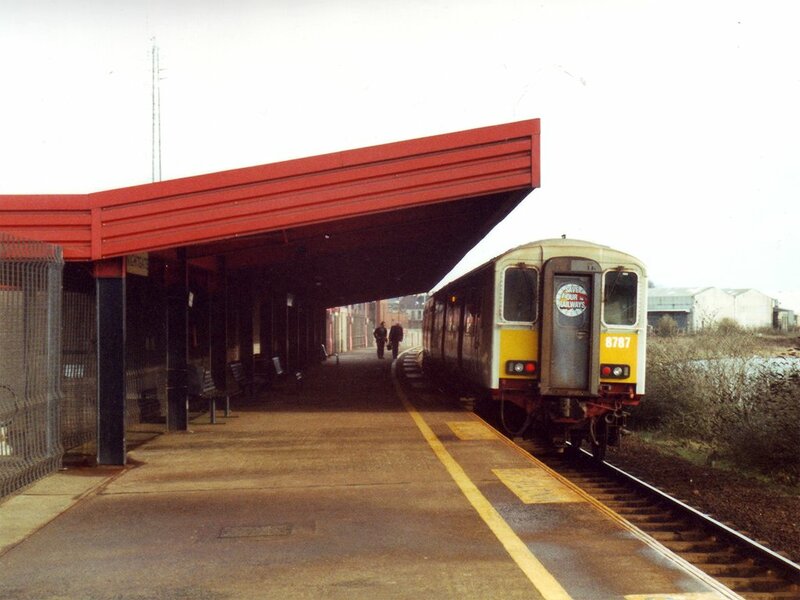 After the minimalist rebuilds already mentioned, the showpiece station at Bangor was a surprise. 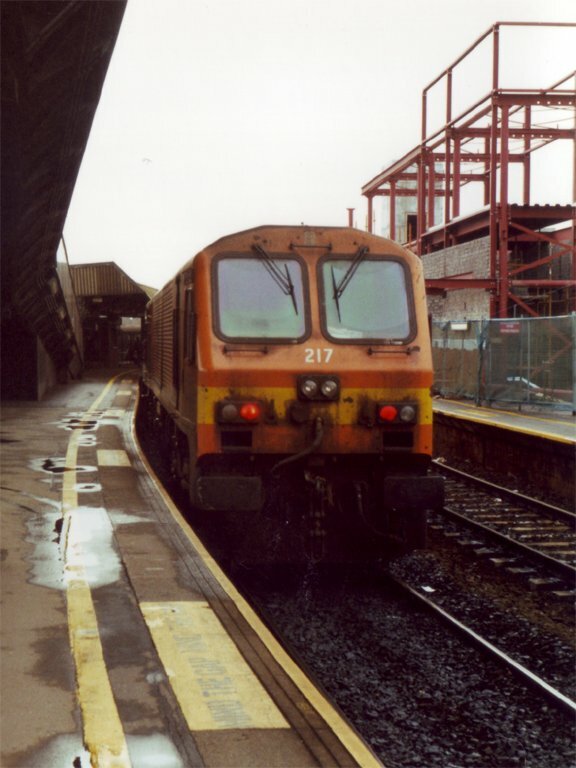 At the dreary Belfast Central, GM Co-Co 217 waits to leave for Dublin with an Enterprise service. The 1624 to Bangor turned up a minute or two late and provided another quite scenic run on the south side of Belfast Lough. The showpiece new station at Bangor is not quite complete but is magnificent by local standards. Only Great Victoria St (1995) gets near. A pleasant walk down to the Royal Hotel to find excellent accommodation awaiting. Or so we thought. Having had a breather we had a walk round the harbour in search of food, ending up at the Windsor which was part of the hotel. Very poor service but a nice meal when it eventually arrived, and an interesting discussion with two locals on the general state of things in NI. Back at the hotel, in suffocating heat, we were intermittently woken until 0130 by loud ‘music’. Ah well. Breakfast OK-ish. Feeling better for delivering our opinion, verbally and in writing, to the reception being we retired to the station for the 0920 to Belfast. [The receptionist was completely disinterested - no response was forthcoming then, or ever. The 'Irish News' reported the Royal in 2017 as having been 'derelict for 4 years', which comes as no surprise, but goes on to announce a £3m conversion to flats and restaurants. ]Having decided that 1000 Dublin as far as Newry and back was too risky timewise, we walked across from Central to GV St. (finding Belfast to be shut on Sunday mornings) and had a trundle out to Larne Town and back. Just time on our return for a quick beer at the Crown, then on to the airport bus and away to Aldergrove for a more or less punctual return to BHX, where a gusty cross wind made for an interesting approach. Virgin and Central Trains got us back to Telford eventually (it being Sunday).